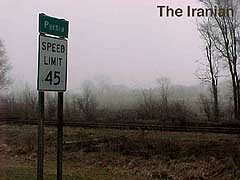 In the 3,000 miles between Washington DC and San Francisco, the only place I really wanted to stop was in Persia, Iowa. But first I had to figure out where it was. I remembered that five years ago, on my first cross-country road trip from New York to San Francisco, it was off Interstate Highway 80. But I could not find it on the road atlas. I drove past Iowa City, and still, no sign of Persia. I stopped at a gas station. Maybe someone there could help. If you have lived in Iowa all your life, there is a good chance you may have heard of "Persia", I thought. "Persia? Are you sure it's in Iowa?" said the woman at the gas station store. "I'm sure. It's a small town." "It must be really small. I've never heard of it. Hey... Jenny? Have you heard of a town called Persia? This gentleman says it's in Iowa." "Nope... check the map in the back." The woman and I looked at a detailed map of Iowa. There were thousands of dots. Fortunately there was an index. "P... P... P... Persia! Here it is. Just before the Nebraska border." I got into the car. My daughter Mahdiyeh was reading. "I was looking for a town called Persia." She was not impressed that there is a town by that name in America. But it was still a few hours away. Mahdiyeh fell asleep. I wondered if Persia had changed since my last visit. Was this little town, with a population of just a few hundred people, finally benefiting from the greatest economy in the world? Had it joined the information superhighway? Had anyone thought of registering persiaiowa.com? Then I thought maybe I should tone down my expectations. What about the only gas station in town? And the high school? Had they reopened? I just hoped Ray's Country Tavern was still in business. I was looking forward to having a drink there and chatting with the locals one more time. I took the exit to Persia. I woke up Mahdiyeh and asked her to take some pictures. She looked around with her sleepy eyes. There was nothing but farmland on both sides of the road and a few trees in the distance, barely visible in the fog. "Take a picture of what?" "This is the road leading to Persia. Just take some pictures. Of anything." "Take a picture of that sign," I pointed. It said "Persia". A few hundred yards away I stopped by the welcome sign. I forced Mahdiyeh to walk across the muddy grass and stand by the sign. I took her picture. "Ageh eeno bezaari roo Internet khodet meedooni-haa..." (I'll hate you if you put this on the Internet), she said. We got into the car and drove on. I parked on Main Street and asked Mahdiyeh to come along. "You have to come. I'm going to be taking a lot of pictures. It might take a long time. You'll like it. We're in Persia." "Have fun. I'll sit right here and read." I walked towards the community center where many people had lined up to go inside. I asked what the occasion was. Someone had passed away. They were serving lunch after the church service. I looked for someone who could tell me about the history of the town. On my last trip I was told that Persia had been named after an Iranian who worked on the railroad in the 1880s. But no one was in a mood to talk about Persia. It was a sad occasion; Persia had lost another resident. I looked at the photographs of "Persians" who had graduated from the local high school in years past. Was the deceased one of them? I walked across the street to Ray's tavern. There was no one there, except the bartender Ruthanne McDonald, and a customer. Everyone else was at the community center. "You're from out of town." "Yes. But I was here a few years ago. I wrote ..."
"Are you the guy...? Did you write something about Persia on the Internet?" Ruthanne rushed through a pile of papers on the shelf and pulled out a print-out of my article about Persia. "Thank you for writing the article. A lot of people enjoyed it." "What brings you here this time? Last time you were on your way to California." "I'm on my way to California again. I lived in Washington DC for a while and now I'm heading back to San Francisco." "Well, nothing's changed here. It's only deader." "I see there's going to be a fire drill tomorrow," I pointed to the fire department announcement. "Yeah. They want to test the siren to see if it works. Doubt it." "Oh it works all right," said the old man at the bar. "Remember the fire last year? The siren went off at three in the morning. That baby was loud." Others started trickling into the tavern, including some I had met on my first visit. But I couldn't stay. Mahdiyeh had been waiting in the car long enough. I rushed to the car, feeling guilty that I had been gone for more than an hour. But Mahdiyeh was not upset. She was more than half-way through "Memoirs of a Geisha". I drove around and looked at the homes. On the way out of Persia, I made one last stop. I went on the railroad track and picked up a piece of wood that was part of the old track. I threw it on the back seat of the car.